The conflict in Darfur is often referred to as an ethnic conflict. But UN Secretary General Ban Ki Moon has said that, amid the diverse political and social causes, it 'began as an ecological crisis, arising at least in part from [drought-induced] climate change'. His unpacking of the complexity in Darfur compares with explanations surrounding the conflict in Rwanda, which shifted from a narrative of ethnic conflict to one centring on colonial powers and access to resources, education and political power. The refugees in Darfur 'fit' within the classic international framework of forced migration because their situation has evolved from drought and lack of access to traditional grazing land to conflict, displacement and encampment. Anke Strauss of the International Organisation for Migration predicts that the world will see an additional 50 million 'environmental migrants' by 2010. She defines the term as those who, 'because of sudden or progressive changes in the environment affecting adversely their livelihoods, have to move from their habitual homes to temporary or durable new homes, either within their country or abroad'. At present this population falls outside the criteria of the two principle tools for providing international protection to the forcibly displaced — the 1951 Refugee Convention and the Guiding Principles for the Internally Displaced. In fact, those moving because of climate change and environmental degradation are outside of the mandate of any of the present internationally recognised instruments and mechanisms for protection and assistance. Furthermore there is no United Nations agency dedicated to their protection. Recently UN High Commissioner for Refugees Antonio Guterres wrote of the international community being seemingly ill equipped to deal with these movements. He acknowledged that discussions are taking place, but urged civil society, the media, and the private sector to engage in advocacy on behalf of these peoples. Last year, Dr Jane McAdam of the University of New South Wales said that it was only when hundreds of thousands of people were displaced after the Bolshevik revolution that the protection mechanisms I have highlighted began to be developed. It seems that the international community reacts rather than anticipates. In October 2007, I visited Kiribati. It has a population of 92,000, and is one of the nations most vulnerable to the effects of climate change. The country's President, Anote Tong, has said that many forms of climate adaptation are possibly too late, and it is time to be talking about the ultimate form of adaptation — migration. It is important that we anticipate the needs of people who are already experiencing the effects of climate change. Australia is well placed to play a leading role in developing new international responses to those displaced by climate change. Dr Maryanne Loughry, a Sydney-based Sister of Mercy, is associate director of Jesuit Refugee Service Australia. 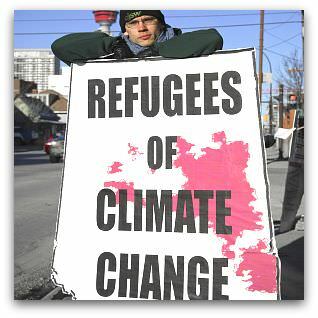 For many years, she was Pedro Arrupe Scholar at the Refugee Studies Centre at Oxford University, where she presented a paper late last year on climate-induced displacement. This editorial is extracted from her presentation at this month's Jesuit Lenten Seminars in Sydney and Melbourne. The full text and MP3 audio are available for download.